Buckskin Gulch: an impossibly deep and tortuously winding channel gutted out of a 200-million-year-old sandstone slab. In many places, it seems more like a cave than a canyon. The grandeur of Buckskin Gulch is almost oppressive. Some landscapes subtly affirm nature’s mastery of the sublime. There’s nothing subtle about Buckskin Gulch. It’s an impossibly deep and tortuously winding channel gutted out of a 200-million-year-old sandstone slab. Its narrows stretch for over 12 miles before it collides with its larger cousin, the Paria. Buckskin Gulch is often described as the “longest slot canyon in the world,” though it’s doubtful that anyone knows such a thing. The world is a big place, and it has many canyons. Even within the Southwest, challengers like Kolob Canyon might protest such an assumption. 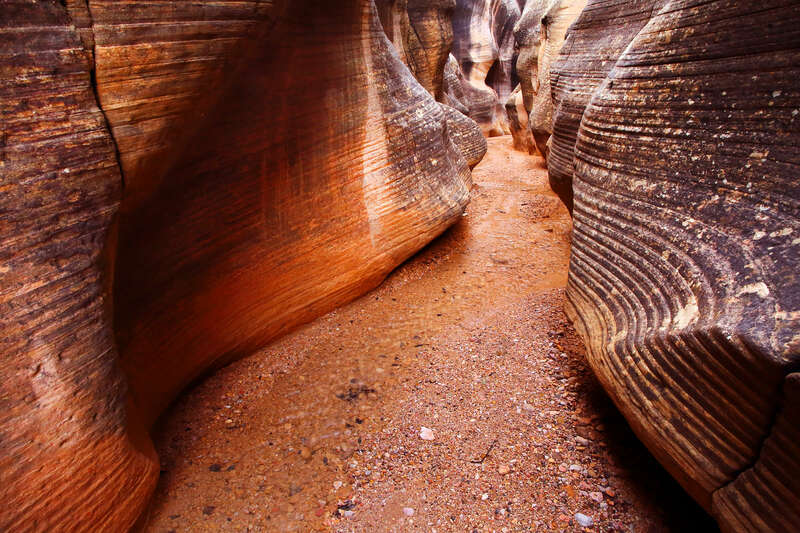 Regardless, Buckskin Gulch is one of the most popular destinations in Southern Utah. Go visit, and find out why. Serpentine hallways draw in close. The sandstone walls curve, recede, and impinge like endless permutations of some arcane algorithm. The canyon floor is cool and still. In many places, it seems more like a cave than a canyon. Only the trill and buzz of wrens break the silence. Reflected sunlight from 400 feet above acquires a rusty hue after rebounding from countless facets of stone. Undulating layers of mahogany, auburn, and tuscan red whisper of the violent surges that ripped them in two. Scalloped walls streaked with desert varnish glow with reflected early morning light. Many segments of Buckskin Gulch look like a sculpture garden. From the Wire Pass Trailhead, walk east across the road and follow a beaten path for about 100 feet to Coyote Wash. Drop to the floor of the wash and follow it to the left (northeast). Coyote Wash runs through open red-rock country with scattered pinyon pines. After a few bends in the wash, ignore a sign directing hikers out of the wash toward The Wave. Continue along the wide, sandy wash toward Wire Pass and Buckskin Gulch. After about 1.3 miles, the walls of Wire Pass close in. They open again briefly, before narrowing down to the point that wide packs could prove a hindrance. Wire Pass lasts only about 0.3 miles before its confluence with Buckskin Gulch. Turn right into Buckskin Gulch. The walls close in almost immediately as you head south down the canyon. Hiking the next several miles is an easy endeavor; the only obstacles are several pools of standing water. These pools are usually less than waist deep, but they can feel ice-cold depending on the time of year. Depending on recent weather, conditions in the canyon can vary from loose, dry sand and rocks to slippery, sticky mud. The trail is generally flat, with little noticeable elevation change. Take time to enjoy the shifting hues of stone and endlessly varied geometry. About 6.75 miles downstream from the confluence of Wire Pass and Buckskin Gulch, the canyon opens up a bit and the rim loses elevation. This is the Middle Route into Buckskin Gulch. The Middle Route is a slanted fault in the sandstone that can be used to scramble out of the Gulch onto its north rim, 100 feet above. Sometimes the route is cairned. If not, it is still somewhat easy to find. Experienced hikers will be able to handle this exit with little difficulty. Others will require a hand line. As is usually the case with scrambling, going up is easier than climbing down. Continuing downstream, the canyon widens and becomes shallower. It doesn’t take long though, before the walls soar to greater heights and draw together like conspiring friends. The trail below the Middle Route is often dry, but there might be a few shallow pools holding out. About three miles below the Middle Route is the well-known rock jam of Buckskin Gulch. It’s a pile monstrous boulders, gridlocked in the bottom of the canyon. The boulders are massive, and don’t seem to move from year to year. The details do change, however. Sometimes the gaps between the boulders are open, allowing relatively easy passage down through and then under the jam. This opening is often called the “rabbit hole.” Sometimes, though, the opening is clogged with sand and flood debris. If it’s clogged, the only option is to clamber over the top of the rock jam and drop about 15 feet to the canyon floor. Often a rope is left tied around a log, facilitating the down-climb. It’s best to over-prepare, so bring a 40-foot rope to use as a hand line as well as lowering packs. Past the rock jam, seeps feed a braided trickle of water into the bottom of the Gulch. It’s not much, but it usually runs year-round. About 1.25 miles downstream from the rock jam, and 0.25 miles upstream from the confluence with Paria Canyon, the exceptionally deep, sheer walls of Buckskin pull apart. An abrupt twist in the canyon shelters a few high banks of sand and soil, covered with grass and groves of trees. 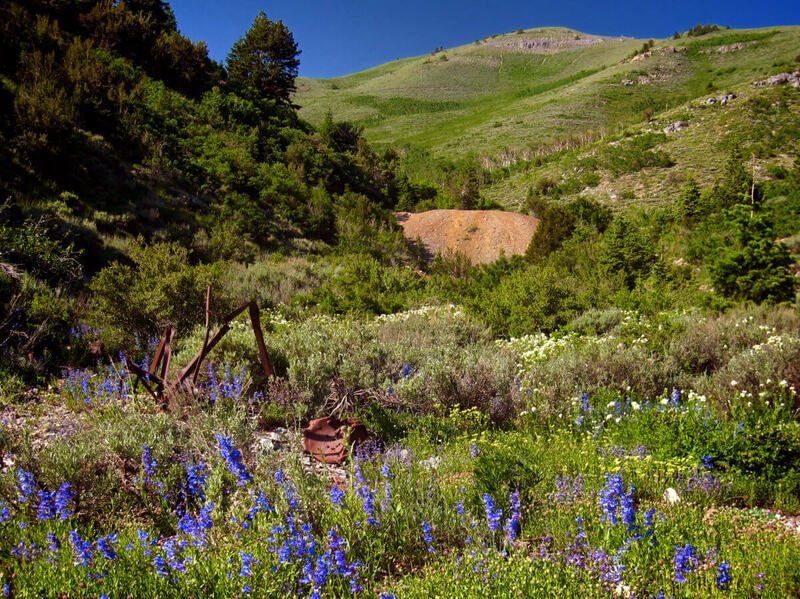 These green, leafy banks offer not only the best campsites in the canyon, but perhaps some of the most striking and scenic campsites to be found anywhere. Another advantage is that these sites are high enough to offer good flood insurance. Unfortunately, since space is limited, these areas may have to be shared. The next closest campsite is found about a mile farther downstream in Paria Canyon. At the confluence, turn north (left) and hike upstream in Paria Canyon. Near the confluence, both canyons boast soaring sandstone walls. 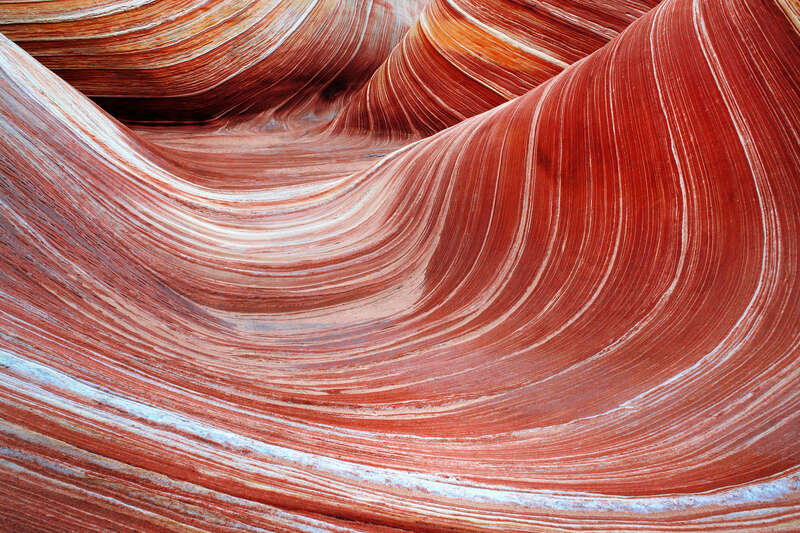 But Paria Canyon is not as narrow as Buckskin. The Gulch feels like some dark, hidden grotto; the relative openness of Paria gives it the airy feel of a monstrous temple. The Paria River is often dry, but there is always a small amount of water trickling out of Buckskin. If the Paria is flowing, consider yourself lucky. Water brings the canyon to life, and makes the hike out much more enjoyable. From the confluence, hike about 7.5 miles north to Whitehouse Trailhead. From Kanab, follow highway 89 eastward for 44 miles. Shortly after crossing the Paria River, turn right toward the BLM Paria River Contact Station. Follow the dirt road about 2.25 miles to the Whitehouse Trailhead parking area. Leave a vehicle and return to highway 89. Drive 4.5 miles west, back toward Kanab. Immediately after passing the cut through the Cockscomb, look for the turnoff to House Rock Valley Road. Turn south and drive 8.5 miles to the Wire Pass Trailhead. Whether for dayhiking or overnight use, permits are required for any type of activity in Buckskin Gulch and Paria Canyon. Permits for dayhiking in either canyon are available at self-serve stations at each trailhead. There are no limits on the number of day-use visitors who may enter the canyons. The fee is $6 per person, per day. Dayhikers must display their permit on their vehicle’s dashboard. Overnight use permits are only allotted to 20 people per day. This is a cumulative total for access from all trailheads. Visitors must apply for these permits in advance, from the Arizona Bureau of Land Management. The cost is $5 per person, per day. Overnight visitors must display the permit on the outside of their backpack as well as the dashboard of their vehicle. Campfires are prohibited inside the canyons. All trash must be packed out, including toilet paper. Human waste bags are provided for free at the Paria River Contact Station, Kanab Field Office, and Arizona Strip Field Office.